ROCHESTER, New York, (July 17, 2013) – The 2013 Northeast Regional Field Target Championship (NRFTC), hosted by Crosman Corporation, concluded with international teams from Venezuela and Canada competing alongside Team USA. Over one hundred competitors participated in the two-day airgun match, single day air pistol match and Quigley Bucket Challenge. “What began as a helping hand to a local field target club has grown into the largest regional competition sanctioned by the American Field Target Association,” said Mark DeBoard, Crosman Shooting Services Manager, of the event hosted by the company on their Bloomfield, NY campus July 12 through 14. Crosman first hosted the event in 2010 when the original competition site became unavailable. The event has grown year after year, “but what’s most encouraging is that entire families are excited about participating together in the sport,” said DeBoard. “The 2013 NRFTC enjoyed more youth shooters than in past years, including 8-year-old Tyler Post and his brother, 12-year old Brent,” commented DeBoard. “Their father and grandfather joined as well,” he said, “making it a fun, multi-generational family competition.” Sydney McDaniel is 16 years old. Her father Sean recently introduced her to field target shooting and she chose this event as her first competition, DeBoard added. A.J. Stewart, 16, who first competed last year, brought his aunt and a cousin, and after spending time in the sport with his son, A.J.’s father joined him as a competitor. Team USA was the big draw as they prepare for the World Field Target Federation Championship in Germany this August. Nine members of the 15-member team were on hand including past NRFTC champions Hector Medina of New Canaan, CT, Greg Sauve of Green Bay, WI and Harold Rushton from Chapel Hill, TN. They were joined by five shooters of Team Venezuela and when a few Canadian participants formed Team Canada, the international side match was on. Scores were based on the team aggregate and after Day 1 it was Team USA (41.33) leading Team Canada (38.83), and Team Venezuela (36.80). Anchored by Rushton, Sauve and Ray Apelles of Somers, NY, Team USA took the weekend with an aggregate score of 88.66. Team Canada finished with 78.66 and Team Venezuela posted a 72.60. WFTF PistonMedina won his first NRFTC WFTF Piston title in 2011 and successfully defended it the following year. After Day 1 he was in a dead heat with fellow Team USA member Keith Knoblauch of Leonardtown, MD, and just three points ahead of Art Deuel from Williamsport, PA. “Lanes 16-30 are deceptively difficult,” commented DeBoard. “Situated along the front lawn of the campus, depth perception on the hillside and especially the wind, which can get pretty squirrelly over there, make those lanes the toughest to shoot.” Sunday was a broiler in terms of both the heat index and the competitive pressure cooker, DeBoard commented. Medina shot a 47 to finish with a score of 86, six shots better than Knoblauch. Rushton drove 14 hours from Alabama to make this year’s Northeast Regional. “Crosman does a great job of organization and set-up. The top shooters are at this competition, and to have Team Venezuela here gives it a world-class atmosphere which is good preparation for the Worlds next month,” said Rushton. He led by just one point after the difficult front side of Lanes 16-30, ahead of Dan Brown of Chagnon Lake, AK who scored a 53. Rushton commented that a lead is nice after Day 1, “but these are some of the best shooters in the country.” A third of the class finished with over 100 successful shots. Field target’s Hunter class is the fastest growing segment of the sport. According to DeBoard, “The class rules allow a shooter to closely replicate an actual hunting setup, from gun to seating, to the use of bipods. It is a comfortable entry to the sport.” John Tyler from Yardley, PA posted a 52 to take a one point lead over Chris Helm of Ewing, NJ and a logjam of shooters. But it was Bill Day of Hollis Center, ME who rose to the occasion on Sunday to surge forward and finish in a tie with Jerry LaRocca of Liverpool, NY. Bill Day won in a shootoff. Greg Shirhall of Richford, NY finished tied for third with Helm and won the shootoff by default after Helm left the event early. Day also won in 2010 and placed third in 2012. Hunter PistonThere was never any doubt after Paul Manktelow of Walworth, NY posted a score of 40 on Day 1. He added a 41 on Day 2 to finish well in front. “The drama was in his rearview mirror,” said DeBoard. Nicolas Gregoris from Binghamton, NY had a handle on second place before his optic gave way. He finished fourth. Jeff Hanson from West Henrietta, NY finished strong using a pre-production Benjamin UL77. “He’s a design engineer for Crosman and spent Saturday evening and Sunday morning repairing a trigger that let go shortly after the end of Day 1,” DeBoard stated. “It was an old trigger pack we had been using for design, not performance. Once I swapped out with a production pack I was able to turn things around,” said Hanson. Open PCPTyler Patner of Mundelein, IL posted the only 50+ score on Day 1 and remained consistent on Day 2 to take the class. Dennis Eden of Port Colborne, Ontario struggled on the open day but a 53 moved him from fourth to second by the end of the event. Open PistonA single point separated Tony Narracci of Massapequa, NY and David Fontaine from Westbrook, CT after Day 1. A second 40+ outing and Narracci was able to pull away. The Pistol competition portion of the 2013 NRFTC took place Saturday afternoon on lanes 1-15. Of a possible score of 30, Craig Evans posted the top score for all pistol classes of 24. Dan Brown won the Hands-Supported class. Evans won Hunter, just a point ahead of Hunter (Rifle) winner Bill Day. LaRocca won the Open class with a 19.Quigley Bucket ChallengeAlways a favorite pre-event competition, the Quigley Bucket Challenge is a re-creation of the dramatic scene in the film “Quigley Down Under” starring Tom Selleck in which Selleck’s character must shoot a bucket at an estimated 700 yards. Scaled for airguns, this equates to a 1.75 inch target placed at 55 yards. Shooters must use a 6.5 ft. lb. rifle using only open / iron / non-magnified sights. The Quigley had 45 shooters try five shots apiece. Just eight hit the bucket and after two overtimes, Sauve was the only shooter to repeat the feat, besting Rushton, Gregoris, Dean Buczek of Canandaigua, NY, Day, Larry Bowne of Levittown, PA, Fontaine and Richard Basset from Feasterville, PA.
For further information on Crosman Corporation or on any Crosman, Benjamin, CenterPoint Hunting and Outdoors precision optics products, or Game Face Airsoft products, visit the company’s web sites at crosman.com, centerpointhunting.com, gamefaceairsoft.com, or write to Laura Evans, marketing coordinator, Crosman Corporation, 7629 Routes 5 & 20, Bloomfield, NY 14469, email her at levans@crosman.com, or call her at (800) 7–AIRGUN (724-7486). For up-to-the-minute news from Crosman Corporation, follow us on Twitter (twitter.com/crosmancorp ) and Facebook (facebook.com/crosmancorp). Rochester, N.Y.-based Crosman Corporation is an international designer, manufacturer and marketer of Crosman® and Benjamin® airguns, CenterPoint® optics, and Crosman®, Game Face™, and Undead Apocalypse® airsoft products. Crosman is a licensee of U.S. Marine Corps airsoft, U.S. Army airsoft, and the exclusive worldwide licensee of Marlin® airguns. The Hunt for Your Legacy STARTS RIGHT NOW! Your legacy is quite possibly the biggest footprint you leave here when it’s time to take your rightful place on the Big Hunt in the Sky. As a Christian man, a loving husband and father, a hard worker, and an avid outdoorsman, I feel that I have a firm grasp on who I am and what my purpose is in this obstacle course called life but is that what I demonstrate in my actions and in my balance between the outdoors, work and family time? Sadly, for many of us, the answer is a resounding no. Where do we go for answers? Where do we go when how we identify ourselves does not match how we are identified? After all, that demonstration itself is our lasting legacy, not what we see in our proverbial mirrors; it’s not what we say, it’s what we do that counts; moreover, it’s what we do in the dark. Author Russell Gough said it best in his book Character is Destiny – enough said there. Few lessons are better learned yet hardly taught outdoors amidst the majesty of God’s creation. Numerous programs and ministries have been centered on taking your kids outdoors; however, few have assisted men in becoming better fathers, teachers and legacy builders. That’s where Legacy Outfitters (LO) steps in. LO works to assist men in becoming doers instead of talkers by outfitting us with the tools to become better Christians, husbands, fathers, sons, and brothers through large and small group outdoor themed fellowships. Through shotgunning, archery, food, presentations, mentoring and forged friendships with other men we gain perspective on our legacies and understanding our strengths and weaknesses with open minds while maintaining accountability are great cornerstones. A second yet no less important focus of LO is to lead people to Christ through outdoor fellowship. What could be better than reaching out to others for Christ amidst the great outdoors and through our greatest passions of hunting, fishing, camping and other outdoor activities? LO exists simply to help men live their true purpose outdoors while equipping others to live their best lives outdoors as well; doing so not only ensures future generations enjoy and protect our outdoor heritage but more importantly centers our focus on celebrating the One that gave us outdoors to begin with. Building a legacy around Him is more than just words, it’s an heirloom of actions and examples for others to emulate and pass on. None of us are perfect; my Grace Community Church family rests on the principle “No perfect people allowed.” We all can use some improvements in our daily lives; as humans we are always out of shape. LO is there to help us whittle away at that shape on the second Tuesday of every month at the Upland Bird Country, located on FM 637, also known as Camp Wanica Road, just two miles east of Highway 287. Monthly fellowships are kicked off with shotgunning and archery loosely starting between 5 – 5:30 p.m. and continue with a great meal at around 6:45. The meal is complemented by great fellowship and dynamic messages from guest speakers centered on God and our outdoor passions. We also explore opportunities to grow in small group ministries known as Focus Groups. These small-group fellowships narrow the search for meaningful friendships based again on LO’s principles and our like passions. Examples of Focus Groups may include archery and bowhunting, rifle hunting, shotgunning, handgunning, cooking and more. To learn more about Legacy Outfitters visit www.LegacyOutfitters.org. If gathering with other hunters sounds like a good time, you have a personal invite! The only rule for new attendees is “Show up!” If you got to choose the footprint you leave behind just how big would it be and where would it point? ROCHESTER, New York, (June 25, 2013) – The Northeast Regional Field Target Championship (NRFTC) hosted by Crosman will welcome members of Team USA. The competition, scheduled for July 12-14, will be held on the campus of Crosman Corporation in Bloomfield, New York and the public is invited to attend this free event. The air rifle event takes place over two days with competitors taking 60 shots each day. Those with the highest number of “hits” will be named winners. Competitors shoot in a variety of divisions and classes based on the equipment they use, taking both their airgun and support equipment into consideration. The event is governed under the rules of the American Field Target Association. Field target requires a shooter to successfully manage a course of fire in which they attempt to knock down steel targets set at distances ranging from 15 to 50 yards. The event is open to all ages. The public is invited to attend the competition as well. “This event is the largest field target competition in the country outside of the National Championship and is likely the final time all these members of Team USA will compete together before the World Championships in August” says DeBoard. “We’ve hosted this event the past four years and the field has gotten stronger each year. There are few opportunities to see world class competitors at the top of their game and we invite anyone who is interested to come out and watch it unfold,” states DeBoard. The match fee is $60 and includes lunch on Saturday along with a free entry in the pistol competition. The pistol-only competition is $25. Those interested in shooting the course for only one day of competing may do so for a fee of $25. One day competitors do not qualify for awards. Registration closes June 30. For more information, including rules, lodging options and online registration, visit the NRFTC page at http://www.crosman.com/nrftc . Participants may choose to register online, or download and mail their form. For further information on Crosman Corporation or on any Crosman, Benjamin, CenterPoint Hunting and Outdoors precision optics products, or Game Face Airsoft products, visit the company’s web sites at www.crosman.com, www.centerpointhunting.com, www.gamefaceairsoft.com, or write to Laura Evans, marketing coordinator, Crosman Corporation, 7629 Routes 5 & 20, Bloomfield, NY 14469, email her at levans@crosman.com, or call her at (800) 7–AIRGUN (724-7486). Rochester, New York, (September 6, 2012) – Crosman Corporation (http://www.crosman.com), international designer, manufacturer, and marketer of products for the shooting sports, pledges to continue support of the Progressive Agriculture Foundation® (PAF) Safety Day® program. The PAF’s mission is to provide education and training to make farm, ranch and rural life safer and healthier for children and their communities. The PAF program trains local community volunteers and provides them with resources to organize and conduct day-long safety training sessions that include age-appropriate, hands-on learning activities. According to PAF Chief Administrative Officer, Randy J. Bernhardt, through donations from sponsors such as Crosman, the PAF has become the largest rural safety and health educational program for youth in North America. “As a supporter of the Safety Day program since 2005, Crosman, along with our other corporate, foundation and individual sponsors, has helped us reach over one million Safety Day program participants,” he said. For additional information about PAF and Crosman, or on any Crosman, Benjamin, CenterPoint optics products, Crosman Archery, Game Face Airsoft or Undead Apocalypse Airsoft products, visit the company’s Web sites at www.crosman.com, www.centerpointhunting.com, www.gamefaceairsoft.com, or write to Laura Evans, Marketing Coordinator, Crosman Corporation, 7629 Routes 5 & 20, Bloomfield, NY 14469, email her at levans@crosman.com, or call her at (800) 7 – AIRGUN (724-7486). Rochester, N.Y.-based Crosman Corporation is an international designer, manufacturer and marketer of Crosman® and Benjamin® airguns, Crosman Archery products, CenterPoint® Hunting and Outdoors Precision Optics and Archery products, and Game Face™ Airsoft products. Crosman is the exclusive worldwide licensee for Remington®, Bushmaster® and Marlin® airguns and airsoft products. The company is privately held. The 2nd Annual Old West Invitational Turkey Shoot will be held May 12-14, 2011 in Hulett, Wyo. The event’s signature sponsor, Remington Outdoor Foundation (ROF), will team up with the Wildlife Heritage Foundation of Wyoming (WHFW) to raise funds to conserve Wyoming wildlife. Event co-hosts, the WHFW and the Greater Hulett Community Center, will welcome celebrities and special guests for a weekend of turkey hunting. A portion of the proceeds from this event will be used to help fund research, education and habitat projects that benefit Wyoming’s game and nongame species. Efforts supported by WHFW include a partnership project to enable Wyoming Game and Fish to assess more than 75,750 acres of critical mule deer range. In addition, WHFW helped fund a study to evaluate the effects of oil and gas wells on Ferruginous hawks and golden eagles. A permanent home for the Wyoming Outdoor Hall of Fame is another project backed by WHFW. Old West Invitational Turkey Shoot guests will enjoy a first-class event consisting of two days of turkey hunting in northeast Wyoming, home to Devils Tower. Western hospitality will be provided by the Greater Hulett Community Center, a nonprofit organization with a mission to transform the former Hulett School into a community center. Hulett residents will help coordinate guides, lodging, meals and transportation. During the event, local landowners will offer hunting opportunities on private land where only guided hunts are traditionally allowed. For stepping up as a signature sponsor for the inaugural Old West Invitational Turkey Shoot, ROF received WHFW’s Downy Gosling Courage Award. That first event raised more than $94,000 to support the good work of the WHFW and the Greater Hulett Community Center. To learn more about organizations ROF is teaming up with, visit their website, OutdoorRoadmap.com, which is poised to become the leading online source of information and services for hunters, target shooters and conservationists. The mission of the Wildlife Heritage Foundation of Wyoming is to create an enduring legacy for future generations through stewardship of all Wyoming’s wildlife. For more information, visit www.whfw.org. Remington Outdoor Foundation, which was founded in January 2009 as a nonprofit 501 (C) (3), supports the efforts of its collaborators to share hunting, target shooting and other outdoor traditions while emphasizing safety and training, recruitment and retention, education, access and awareness. ROF upholds conservation principles through supporting work on habitat enhancement, wildlife research and management projects. OutdoorRoadmap.com is expected to become the single online source of information and services related to hunting, target shooting and conservation. By teaming with interested participants, OutdoorRoadmap will offer interactive maps and tools, special offers, event listings, training and licensing resources, and a wealth of outdoor information. For more information about this state-of-the-art platform, visit www.OutdoorRoadmap.com. The World’s Championship Duck Calling Contest in Stuttgart is the longest running calling contest in history. The greatest duck callers from across the United States and Canada have gathered on Main Street during the weekend after Thanksgiving in order to determine who the World Champion is. In modern days the contest has become the centerpiece of the “Wings over the Prairie Festival” in Stuttgart. Gone are the days when a duck caller need only show up to compete. Now in order to qualify to compete for the World’s Championship, a caller must win a preliminary calling contest that is sanctioned by the Stuttgart Chamber of Commerce, the body that governs and runs the World’s Championship Duck Calling Contest as well as the “Wings over the Prairie Festival.” It is a difficult feat to become the World’s Duck Calling Champion, and it often catapults the winner to a career in the outdoor industry. For more information, visit www.stuttgartarkansas.org or call 870-673-1602. Haas Outdoors Inc. is headquartered in West Point, Miss., was established in 1986 and is home of Mossy Oak (http://www.mossyoak.com/). Mossy Oak specializes in developing and marketing modern camouflage designs for hunters and outdoorsmen. Mossy Oak patterns can be found on a multitude of products worldwide. Haas Outdoors Inc. is the outdoor industry leader in modern camouflage design, international licensing and marketing. Haas Outdoors Inc. markets its services and products under widely recognized brands including: Mossy Oak, BioLogic, Mossy Oak Productions, Nativ Nurseries, MOOSE Media and Mossy Oak Properties. The weekend of October 2 marked a major milestone for the U.S. Sportsmen’s Alliance Foundation’s (USSAF) Trailblazer Adventure Program. It reached one million participants in less than ten years since its pilot program. Now the race is on to reach the second million. With the help of people like you, the USSAF aims to reach this new milestone in only five years. Trailblazer began in 2001 as a small pilot program in Atlanta, Georgia. It has rapidly grown over the years. Now over 200,000 youth and their families attend annually. Each event offers opportunities for youth, especially urban youth, to learn about shooting, hunting, fishing, trapping and other conservation programs. Many organizations have helped make Trailblazer the success it has been. Now, the USSAF is seeking new supporters to accomplish it’s goal of reaching another million participants. For that to happen, the generous support of people like you is essential. We would like to take this opportunity to thank you by offering you a FREE One Millionth Participant Commemorative Patch ($4.95 S & H). We have a limited number of these patches, so order yours NOW! Click here to order your FREE Commemorative Patch. They are sure to be collector’s items. When you order your commemorative patch, please consider helping us work toward our next million. A sponsorship of only $3.50 allows us to introduce one youth to a world of fishing, hunting, trapping and many other conservation practices. These young people will be our next generation of hunters, anglers, trappers, and outdoors enthusiasts. They will be the ones that will protect our outdoor heritage! Sponsor three (3) or more young people and we’ll pay the S & H for your patch! Questions? Call 614-888-4868. Also, be sure to check out the latest video the USSAF has put together about the history of the program. By helping Trailblazer reach that second million, you are helping to keep the legacy of the outdoor lifestyle alive for generations to come. Fort Worth, Texas – As hunters start taking regular trips to the deer lease or hunting ranch to check on blinds, fill feeders and set out Cuddeback® trail cameras, July and August mean one big thing to Texas hunters, the Hunters Extravaganza trade shows, produced by Texas Trophy Hunters Association™ (TTHA), officially kick off the beginning of hunting season.The 2010 Fort Worth Hunters Extravaganza show takes place THIS WEEKEND at the Will Rogers Center, August 20-22, 2010. Showcasing more gear, guides and outfitters than ever before, the Hunters Extravaganzas prepare the Texas hunter with everything needed to hunt that trophy whitetail buck of a lifetime. Plus, there will be more FREE prizes, contests and attractions than ever before. The Hunters Extravaganza® truly is the Granddaddy of all hunting shows.Everyone who walks in the door can register for FREE hunts and prizes in the Texas Sized Giveaway including a trophy hunt for two whitetail bucks at the Bella Vista Ranch, a pronghorn hunt at 4F Outfitters, one of 30 pairs of Nikon™ binoculars valued at over $200 each, or many other great prizes. Attendees can try their hand at the TTHA 3D Archery Championship Tournament plus see the biggest and best trophy mounts from last season in the Annual Deer Competition sponsored by Nikon™. Kids will love the Lone Star Bowhunters Your Archery Range, the Texas Junior Anglers Catch Fish Pond and Joe Martin’s Snakes of Texas! The Hunters Extravaganza is truly fun for the whole family. The Fort Worth show will feature Outdoor Celebrities available for autographs and photos with attendees including: Don & Kandi Kisky of Nikon’s Pro-Staff & Whitetail Freaks TV Show; “Dr. Deer,” James Kroll, PhD of Institute for White-Tailed Deer Mgmt & Research; and 9-time UFC Welter Weight Champion, Matt Hughes. The Hunters Extravaganza is the chance for hunters to take advantage of BIG savings before the season starts! This year, people can get a FREE membership to Texas Trophy Hunters Association with the purchase of a weekend pass! The Hunters Extravaganza show hours will be Friday 3pm to 9pm, Saturday 9am to 7pm and Sunday 10am to 5pm. The ticket prices are ONLY ten bucks for adults, five bucks for kids 13-17, while kids 12 and under free. Members of Texas Trophy Hunters Association get in FREE on Friday. In honor of our servicemen and servicewomen, Active Military personnel who show their ID to get in free all three days. The Hunters Extravaganza is sponsored by Nikon® Sport Optics, Bad Boy Buggies®, Mossy Oak Camo®, and Cuddeback® Digital Scouting Cameras, Barnes Bullets®, Barnett Crossbows® and the National Rifle Association. For more information, go to http://www.ttha.com/. TTHA strives to unite all segments of the hunting community for the dissemination of information and joining of energies to promote and protect our hunting heritage. Founded in 1975, TTHA, a membership-based organization, publishes a bimonthly magazine, The Journal of the Texas Trophy Hunters, and produces the award-winning outdoor television program, Trophy Hunters TV®. In addition, TTHA hosts the Hunters Extravaganza® outdoor expositions, renowned as the largest whitetail hunting shows in the South. For membership information, please join online at TTHA.com or contact TTHA Membership Services at (877) 261-2541. ThermaCELL Starts Their Appliance-A-Day Giveaway! Visit ThermaCELL and get plugged into the Appliance-A-Day Giveaway TODAY! 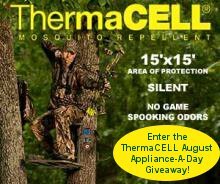 ThermaCELL began their August Appliance – A-Day Giveaway on Aug. 1, giving one lucky person a free ThermaCELL unit every day of the month. Check out the link or click on the picture on the left to try your luck. The only thing this event costs is a minute of your time. ThermaCELL does not spook game! ThermaCELL now offers Earth Scented pads – perfect for bowhunters! Scores of hunters around the country will tell you, ThermaCELL just can’t be beat for outdoor protection from mosquitos and black flies. I hunt extensively in areas highly regarded as unbearable by people who have never tried ThermaCELL and I do it without a single mosquito bite! Unless it’s in the dead of winter, you’ll never see me on a hunt without it!